William Biggs, hosier and political reformer, was born in Leicester the third child of John Biggs, founder of the Leicester hosiery firm of John Biggs and Sons, which had become one of Leicester’s leading businesses by the 1840s, noted for its export trade to North America and Australia, and its innovations in fancy hosiery and glove-making,. The family was already part of Leicester’s dissenting elite through their membership of the Unitarian Great Meeting and this status was further strengthened through the 1837 marriage of William Biggs to a daughter of John Worthington, yarn merchant, of Leicester, a leading member of a family of distinguished Unitarian ministers. 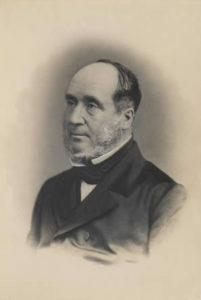 An active partner in the family hosiery firm of John Biggs and Sons, William, like his brother John, also pursued a political career. Both were among the leaders of the assault by mostly disenfranchised Non-Conformist Whigs/Radicals on the entrenched and openly corrupt and in effect unelected old Corporation through its final years. The two brothers were both elected to the new Town Council in the political landslide of December 1835 and took up office on 1 January 1836. William Biggs served on the Council continuously for thirty years, and was elected Mayor in 1842, 1848, and 1859, and appointed JP in 1850. As a councillor, Biggs was at the forefront of the decision to auction off all of the Corporation’s historic regalia, china, wine and the rest of the symbols of the old Corporation and its tradition of lavish entertainment of its own members and political friends. William Biggs took the lead in organising a police force, and supported John’s proposals for extensive civic and social improvements. Over its first decade and a half almost every year the reformed Corporation promoted parliamentary bills for the authorisation of major public works including street, water, drainage, flood prevention, slum clearance, creating a public cemetery, and other mostly health-related works, and Leicester was one of the first towns in the country to adopt the 1849 public health legislation which provided a much simpler and cheaper method of gaining approval for such initiative. William Biggs, though originally a founder member of the short-lived Leicester Philosophical Society, joined the Lit. and Phil. by the time of its 1836-37 session if not earlier. Within the Lit. and Phil. the development of the Museum was a special interest, and it was under his leadership and influence that the 1847 agreement between the Town Council and the Society for the transfer of the Museum was settled, and Biggs was the Mayor who presided with Lit. and Phil. President Colin Macaulay at the formal hand-over and opening of the Museum in the New Walk building in June 1849; 4 months later Biggs succeeded Macaulay as Lit. and Phil. President. In July 1852 he was elected MP for Newport, Isle of Wight, and represented this until his resignation in December 1856, when John Biggs became MP for Leicester. In the house he promoted charitable causes and progressive politics, including the need to reform and improve working conditions in the knitting and other industries. As Mayor for the third time in 1859 he supported the volunteer forces movement, and secured the formation of a company of the rifle corps in Leicester. However, the fortunes of the family firm were in decline from the 1850s. Perhaps the time spent by the two principals in the political world did not help, and first the Crimean War (1853-56) disrupted some of the export trade, while the outbreak of the American Civil War in 1861 seems to have been a final blow. In 1862 John and William had to sell William Biggs and Co. and their respective large Leicester mansions and both withdrew from public life, while William’s sons had left Leicester to find other employment. Three of the sons went to Liverpool, and William moved there also in 1866, and died there in 1881. However, his body was brought back to Leicester and buried in the Welford Road Cemetery which he had officially opened as Mayor on the same day as the opening of the Museum.